US President Donald Trump's top two envoys met with their Indian counterparts in Delhi on Thursday to deepen a fast-growing partnership but also to tackle thorny issues ranging from an ongoing trade spat to India's purchase of Russian military gear. Both sides say the unprecedented "2+2" meeting is proof of how far US-India ties have come in recent years, though the officials must tackle several contentious areas where they don't see eye to eye. "We fully support India’s rise as a leading global power," Secretary of State Mike Pompeo said at the start of the summit. The two countries are eager to deepen ties as a way of countering China, whose economic and military might grows stronger by the day. In an apparent reference to China and its Belt and Road initiative -- which floods developing countries with cash for infrastructure projects that sometimes cannot be repaid -- Pompeo said the US and India wish to pursue "fundamental rights and liberties and prevent external economic coercion." 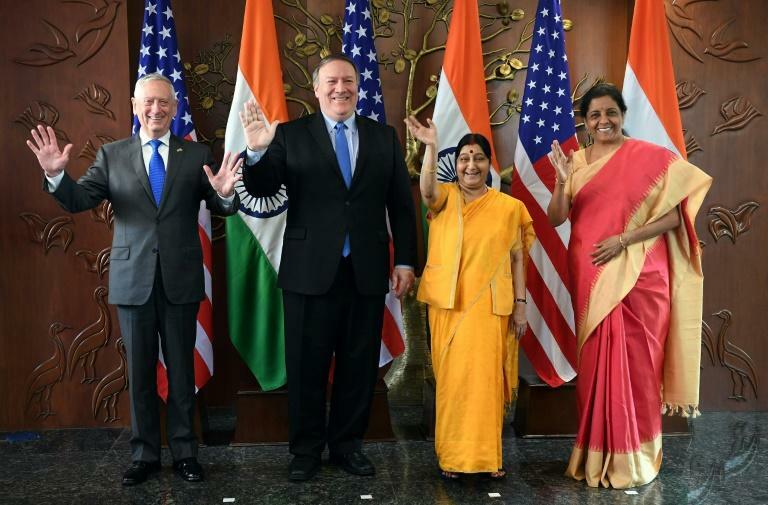 Pompeo was joined by US Defense Secretary Jim Mattis, and their Indian counterparts Sushma Swaraj and Nirmala Sitharaman. Swaraj said India attaches the "highest priority" to its strategic partnership with the US, and sees America as a "partner of choice." In 2016, Washington designated India as a "major defence partner", making it easier for the two countries to do arms deals. India however is finalising a deal with Moscow to buy new systems including its S-400 long-range, surface-to-air missiles. Pompeo and Mattis will likely bring the issue up and ask India to distance itself from Russia. Under current US rules, third countries could face sanctions if they transact with Russian defence or intelligence sectors. If the S-400 deal is finalised, India has signalled it will ask Washington for a special waiver from sanctions, though a US official last week said there is no guarantee it would do so. The talks were also expected to touch on expanding the scope and complexity of joint military exercises. Additionally, India and the US are close to signing an agreement that would ensure communications between their two militaries are compatible and secure. India already has bought US Apache attack helicopters and other gear, and is negotiating to buy armed drones. The talks were first meant to be held in April and then in June but both were postponed, triggering speculation of a rift. In May, Trump pulled the US out of the 2015 nuclear deal with Iran and said other countries, including India, must stop buying oil from Tehran before November 4 or face US sanctions. India however is highly reliant on Iranian crude imports. India has a $25 billion trade surplus with the United States, and to reduce that the Trump administration is reportedly pressing India to take more US imports. A draft agreement put forward by Washington last month committed India to accepting more imports of US in the areas of civilian aircraft and natural gas, taking Indian officials by surprise, the Hindu daily reported on Thursday. Pompeo said on Tuesday the issues of Russian arms sales and Iranian oil "will certainly come up, but I don't think they will be the primary focus of what it is we are trying to accomplish here." "There are half-a-dozen things on the agenda that we are really intent on making progress on... They are really about things that are big and strategic and will go on for 20, 40, 50 years."